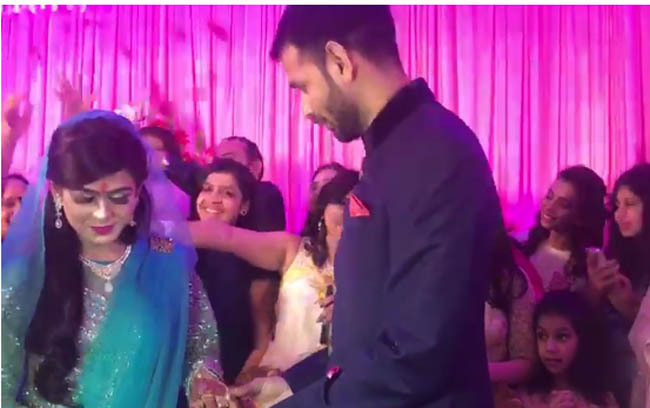 Patna, April 18 (IANS) Tej Pratap Yadav, the elder son of now jailed RJD chief Lalu Prasad and former Chief Minister Rabri Devi, on Wednesday got engaged to senior RJD leader Chandrika Rai's daughter Aishwarya Rai here. Former Bihar Health Minister Pratap, who celebrated his 29th birthday two days ago, exchanged rings with 25-year-old Aishwarya Rai at a traditional function. Lalu Prasad is currently in jail in connection with three fodder scams. Aishwarya Rai is also the grand-daughter of former Chief Minister Daroga Prasad Rai. The ceremony was attended by close family members and relatives including Pratap's sister and RJD Rajya Sabha MP Misa Bharti and his brother and the Leader of Opposition Tejashwi Yadav. For the wedding, which is likely to take place next month here, Lalu Prasad is expected to seek judicial permission to attend it. Lalu Prasad's youngest daughter Raj Laxmi tied the knot with the grand-nephew of Samajwadi Party patriarch Mulayam Singh Yadav in 2014.